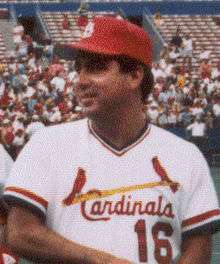 Leyva coaching for the Cardinals, 1987. Nicholas Tomas Leyva (born August 16, 1953) was recently the first base coach of the Pittsburgh Pirates. Leyva is a former minor league player and manager and has spent over a decade as a Major League Baseball coach. He was the manager of the Philadelphia Phillies from 1989 though early 1991. Born in Ontario, California, Leyva, who is of Mexican-American descent, attended the University of LaVerne, and was selected by the St. Louis Cardinals in the 24th round of the 1975 Major League Baseball Draft. He was an infielder who threw and batted right-handed, stood 5 feet 11 inches (180 cm) tall and weighed 165 pounds (75 kg). In three seasons (1975–77) in the Cardinals' farm system, he appeared in 253 games played and batted .267 with 208 hits, eight home runs and 109 runs batted in. As a Major League Manager & Coach Leyva has Worn #16 with Every Team he's been with except for his 1st Year in Toronto in 1993 where he Wore #45 before Switching Back to his Familiar #16 in 1994. He began his managing career at age 24 with the Rookie-level Johnson City Cardinals of the Appalachian League in 1978. By 1983, he was manager of the parent Cardinals' Double-A farm team, the Arkansas Travelers of the Texas League. He then served on the big-league coaching staff of Whitey Herzog's Cardinals for five seasons, 1984–1988. He was the first base coach for the National League champion 1985 Cardinals and third base coach for the NL champion 1987 Cardinals. In 1989, he was hired as manager of the Phillies by his former farm director in St. Louis, Lee Thomas. But Leyva's inaugural Philadelphia team won only 67 of 162 games, and finished last in the National League East Division. In 1990, his team won ten more games and finished fourth, but still played eight games below the .500 mark. When the 1991 Phils dropped nine of their first 13 games, Leyva was ousted on April 23. His career totals as a Major League manager were 148 victories, 189 defeats (.439). After managing the Toronto Blue Jays' Triple-A farm team, the Syracuse Chiefs, Leyva spent 4½ seasons (July 1993 through 1997) as the third-base coach of the Blue Jays—his first term in the job. He then worked at multiple levels of the Chicago White Sox farm system before spending one season as third-base coach of the Milwaukee Brewers in 2007. He was listed as the 2008 manager of the Kingsport Mets of the Appalachian League, a Rookie-level affiliate of the New York Mets, before the Blue Jays rehired him as their third base coach on June 20, 2008, when Cito Gaston replaced John Gibbons as the club's manager. On October 30, 2009, Leyva was reassigned as the Blue Jays' bench coach, with Brian Butterfield taking over as third base coach for the team. On November 8, 2010, former Seattle Mariners manager Don Wakamatsu was named Toronto's bench coach, ending Leyva's tenure at that post. On November 24, 2011, Leyva was named the Pittsburgh Pirates' third base coach, under new manager Clint Hurdle. On November 5, 2014, the Pirates announced that Leyva will be moved to be the first base coach and Rick Sofield will move from first base to third base. On October 22, 2016, the Pirates announced that Leyva has been reassigned within the organization to an advisory position and will no longer be a major league coach. Leyva's younger brother, Al, is an assistant coach with the Newport Gulls of the NECBL. ↑ "Baseball Notebook; Bo Jackson's Contacts Swing From Backfield to the Outfield". The New York Times. November 20, 1988. ↑ Langosch, Jenifer (2010-11-24). "Bucs finalize coaching staff, with three returning". MLB.com. Retrieved 2010-11-24. Bucek, Jeanine, ed. dir., The Baseball Encyclopedia. New York: Macmillan Books, 1996.